Some small businesses across Australia and New Zealand are winning the digital race for the customer. 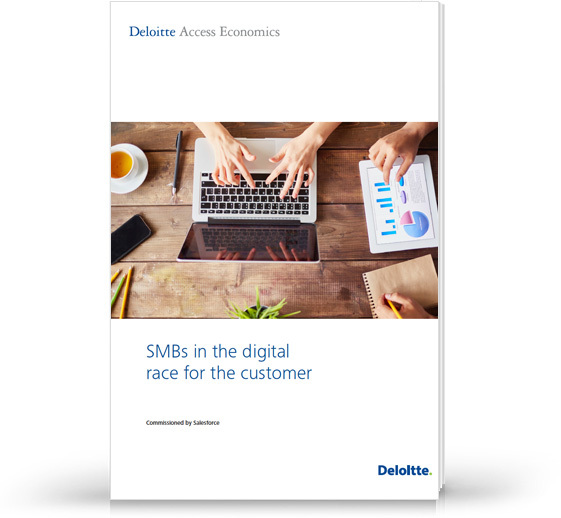 This study from Deloitte Access Economics proves you can increase revenue by making smart investments in digital, regardless of the type of business you run. A 1% increase in online services could increase revenue by $100,000 per year for a typical SMB. In the next 5 years, 50% of SMB sales will involve digital channels, and 40% will use marketing automation tools to acquire customers. 50% of SMB owners rank customer retention as the #1 factor of future success, yet most lack the data and tools to build loyalty. As a small business leader, discover how the right digital strategy could unlock extra revenue, and help you find, win, and retain more customers.